Inbox menu is designed to present all allocated activities and facilitate accessing pending tasks. 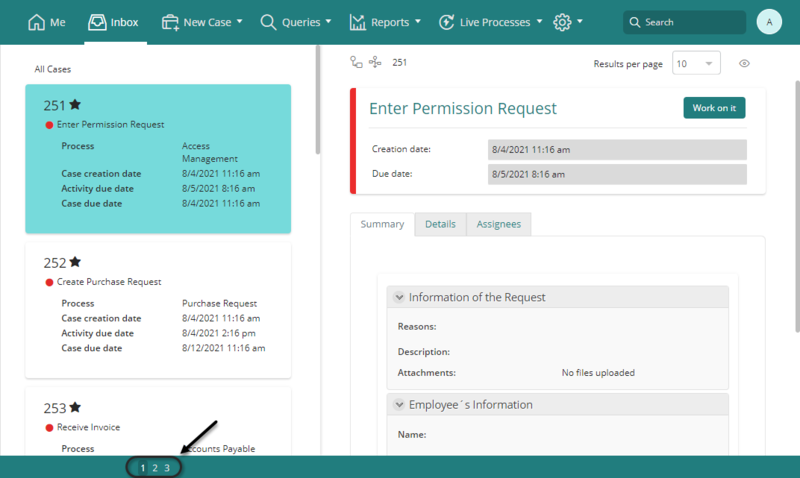 The Inbox is composed of different areas that will help you perform, manage and control your Processes. If the logged in user has not been defined as a Stakeholder, his/her default view will be the Inbox. Only users that have been defined as Stakeholders will have access to Me menu. As soon as a user is associated to a stakeholder definition, the Me menu will become his/her default view. All allocated cases will appear in the Inbox and by default present the following information. This information can be customized according to your needs. For further information please refer to customize and parametrize columns. Application and category to which a case belongs. Process to which the current Activity belongs. If the Activity is part of a Plan, the Plan name will be used. Creation date of the current Activity. Solution date of the current Activity. Expiration date of the current Activity based on the expected Activity duration. The task states are designated using three colors and is determined by the elapsed time taken from the moment the Activity was created coupled with the duration time defined for the task. • Green: indicates the Activity is on time. • Yellow: indicates the Activity is at risk. A task is considered at risk when the remaining time before expiring is equal to or less than the defined in the Risk signal property of processes. By default the risk signal is 24 hours. • Red: indicates the Activity has expired and is overdue. The Inbox can be displayed in two different views: Details and Grid. You can change the them at any time by selecting the view icon located below the Logout option. Either for Details or Grid view you can customize the number of rows by page in your Inbox. At the top right, select results per page and choose one within: 10, 20, 30, 40, 50, 100. The work area will display a scroll bar if the height of the browser cannot display the selected number of results. If you select a filter in the case area, the number of rows per page selected remain. The Grid view displays the main information of the Inbox in a table. Each row of the table is a pending case. You can click on View Summary to obtain further information about a particular case, without actually accessing the case. To access and work on an case, click on the State link or the Case Number link. You can mark a case as Favorite by clicking the Star icon in the uttermost left column of the relevant case. This option is not available for Live Process cases. You can access the graphic query by clicking the graphic image alongside the star icon. 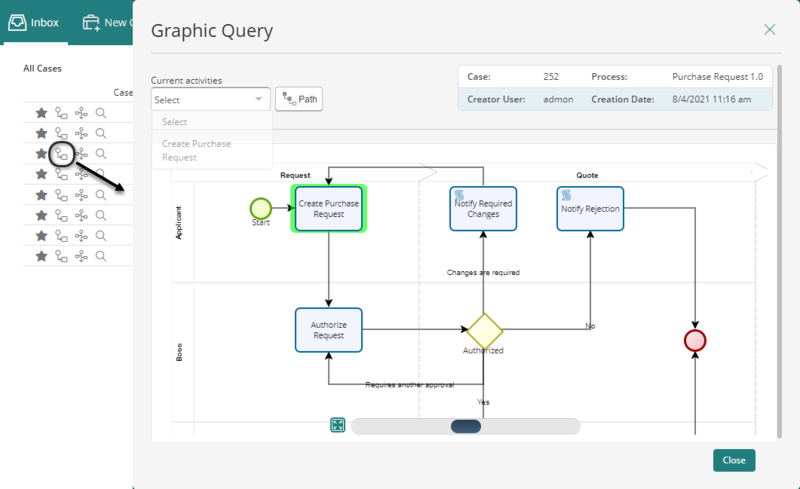 In this screen you can view the path followed by the case through the Process in a graphical way. You can access a case's Timeline directly by clicking the timeline icon on the case's record. 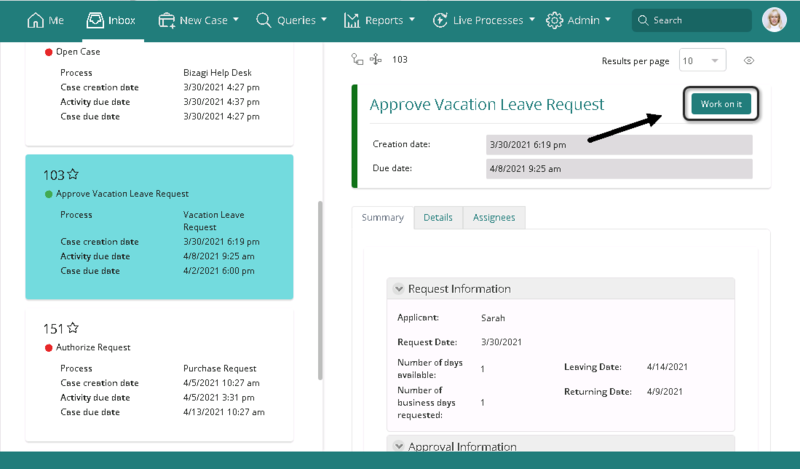 In this screen, you have the visibility of the entire case, viewing in a graphical way the activities launched, the users involved, and the time spent in every activity of a case. 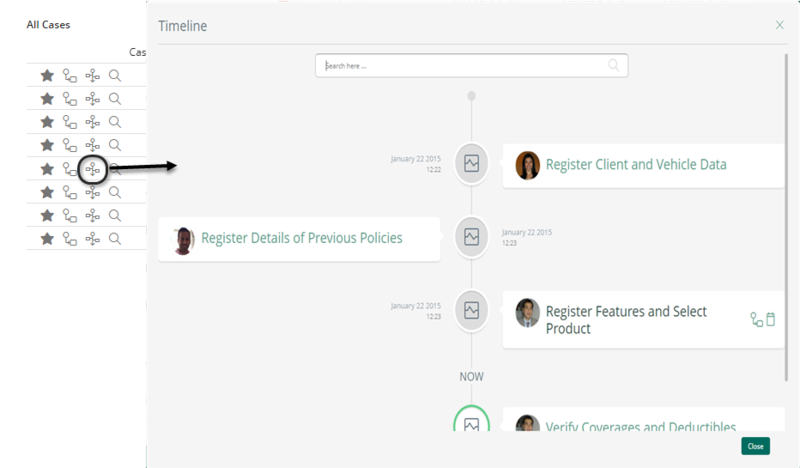 The timeline displayed through this option does not cover the Process map and Activity map options. This option is not available for Live Process cases. To see more Activities, view any of the web pages by clicking the page numbers on the bottom of the grid. In the Grid view each row of the table is a pending case. You can work on a pending Activity by clicking the access link in the Activity column of the case. In the Details view you can see detailed information about a particular case. You can navigate the pending cases at the left of the screen. 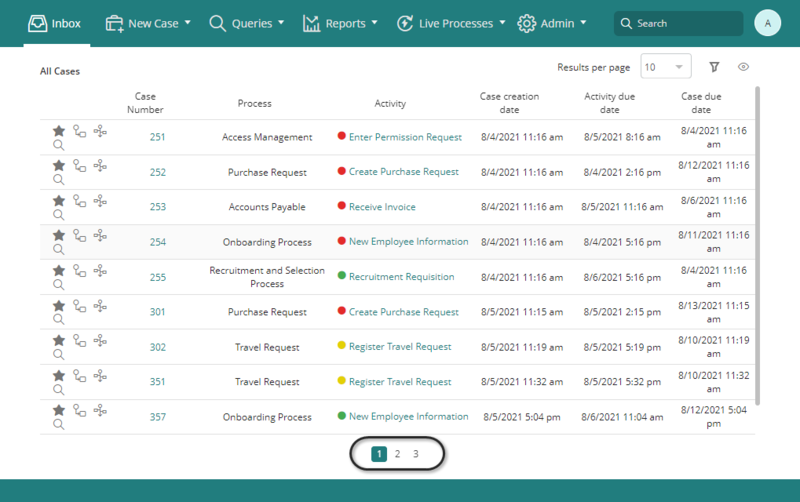 Click a case to display the Summary information and the Assignees log of the selected case on the screen at the right. To access any of the Activities, select Work on it. To mark a case as Favorite, click the Star icon on the upper left of the case navigation panel. Please note this option is not available for Live Process cases. To see the case graphic query, click the graphic image located in the upper left of Summary Information panel. Please note this option is not available for Plans. To see the case's Timeline click the image located in the upper left of Summary Information panel. Please note this option is not available for Live Process cases. To see more Activities, move through the pages by clicking the page numbers on the bottom of the screen. In the Details view you can see detailed information about a particular case. You can navigate the pending cases at the left of the screen. In this view you can work on a pending Activity by selecting the Work on it button of the selected case.